Throughout the month of May the Carolina Mountain Club will be hosting informational workshops concerning the problems associated with invasive plants along the Appalachian Trail. The workshops will be taught by expert instructors who will discuss the problem of invasive exotic plants, threats to native biodiversity, identification of 12 to 15 plants of particular concern, and management techniques used along the Appalachian Trail. A workshop will be held on each Saturday throughout the month of May and will include a hike along various sections of the Appalachian Trail in the Pisgah National Forest, including hikes beginning from Lemon Gap, Sam's Gap and Roan Mountain. The first workshop is tomorrow. Click here for the schedule and contact information. As part of its Naturalist Series, Chimney Rock State Park will be offering a park-wide Wildflower Walk on May 15th. In a quest to see the maximum diversity of wildflowers, this program will take place on several trails throughout the park. Be prepared to walk about three miles with frequent stops to study in detail some of the 700+ species of plants known to occur at Chimney Rock. The program will last from 10am-3pm (lunch break at noon) and will cost $35 for Adults, $30 for Annual Passholders, $25 for ages 6-15, and $15 for Grady’s Kids Club Members (includes Park admission for the day). 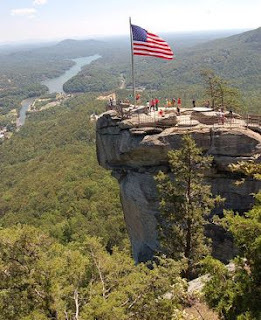 For more information on the trails at Chimney Rock State Park, please click here. Backpacker Magazine’s “Get Out More Tour” will bring Randy and Sheri Propster to the Great Smoky Mountains area over the next couple of weeks. Get Out More is a one-of-a kind mobile tour that brings the pages of Backpacker to life for audiences nationwide. From April to December, Backpacker’s experienced Get Out More road team will travel the country to educate consumers about the skills and equipment they need to Get Out More! The tour, presented by Woolrich, will visit 73 venues in 48 states to encourage hikers and backpackers to get out and explore the great outdoors. The couple will give free presentations covering a range of topics including essentials of backpacking, the latest in gear and apparel, survival skills, and trail-tested tips. Giveaways at each retail location will offer participants the chance to win outdoor gear and apparel. In keeping with the theme from earlier today, I wanted to point out an article that was posted on Trailspace.com yesterday. 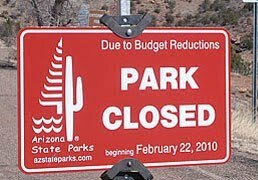 * Arizona has been forced to close five state parks and reduce days of operation at four others. * Forty-one state parks and 14 historic sites in New York would not open this summer under Gov. David Paterson's budget-cutting proposal. The parks are in limbo until state lawmakers agree on a budget for 2010-11. Click here for a list of proposed closures. * The Idaho state government threatened widespread closures, but relented after funding was found to keep the parks open this year, albeit with reduced services and seasonal closings at some parks. * California is eking by with higher fees, seasonal closures, and deferred maintenance, but a proposed ballot initiative that would raise car registrations by $18 (and allow all state residents to attend parks for a fee) could come to the rescue. * New York, Colorado and Oregon have resorted to increases in camping and entrance fees. Back in February I warned that out-of-control spending by our government - at all levels - could threaten the viability of our parks. Apparently I was right much quicker than I anticipated. "some say that the very future of the euro project hangs in the balance"
Greece is in a very serious predicament right now. The country's debt as a share of GDP is 113%. America's is roughly 63% - a post WWII record. The Congressional Budget Office forecats that it will reach 90% by 2020 under the latest budget proposals. I'm not saying that the United States' situation is as bad as some of the countries in Europe right now, however, we are clearly going down the same path that they've already blazed. Which brings me back to our local, state and national parks. In a debt crisis, these budget line items will be much too easy to reach the chopping block. As we've already seen, more parks will be closed, or there will be reduced services and/or increased fees. As I pointed out in my February article, it's not too hard to imagine that someday federal and state governments could be forced into making radical changes to our parks. Is it possible that "unproductive" parks could be sold to private organizations in order to help pay down the debt? Maybe the National Park Service or state parks could end up selling or leasing park lands for the building of lodges, condos or golf courses. What about corporate sponsorship of parks? Can you imagine: "The Cades Cove Loop brought to you by McDonald's"! Folks, we the people of the United States need to take back our country from the career politicians that are only in it for themselves. * The latest wildflower report from Tom Harrington has been posted on the Great Smoky Mountain Association's website today. The report includes wildflowers he saw on the Porters Creek Trail and on his hike to Mount Cammerer. Please click here to see the full report. * The online Blue Ridge Parkway Guide has a wildflower bloom schedule on their site that offers what varieties can be seen on the Parkway, where to generally find them, and when to find them. Click here to view the schedule. * Don't forget Wildflower Weekend in Shenandoah National Park will be held on May 8-9 this year. Several hikes, walks and wildflower related programs are scheduled throughout the weekend. More than 1,300 species of plants thrive within Shenandoah National Park. Please click here for more information. * For more information on hiking trails in Shenandoah National Park, please click here. And for hiking trails along the Blue Ridge Parkway, please click here. You can view the entire 42-minute interview, which covers a range of topics and phone calls from individuals, by clicking on the C-Span web site. The video was supposedly taken near Estes Park just outside of Rocky Mountain National Park. "We proceeded on" was the phrase Meriwether Lewis often used in his journals as he and William Clark made their trek to the Pacific Ocean and back. This phrase would be quite appropriate for a few modern day travelers as they proceed on with their own expeditions. I thought I would take this opportunity to provide an update on some of these treks that I've mentioned on this blog in the past. That title sounds almost biblical. However, some of you may recall a story I did a few weeks ago regarding Mike Hanson, the blind hiker who was attempting to hike the entire length of the Appalachian Trail. Mike just reached the town of Damascus in Virginia the other day. Getting to Damascus wasn't easy. In a 3/27/10 posting on his blog, Mike stated that he needed to bypass the Smoky Mountains due to the unusually deep snow and ice conditions at the higher elevations. Mike plans to hike that section after reaching Maine in a couple of months. Peter Barr is also hiking the Appalachian Trail. In addition to hiking the iconic trail, Peter is also using his trek to raise money to restore the Shuckstack fire tower in the Great Smoky Mountains. Peter recently crossed Big Bald Mountain and was in Erwin, Tennessee as of yesterday. You can find more information regarding his campaign and follow along on his website. Smoky Scout and Danny Bernstein continue to tackle their section hike of the Mountain-to-Sea Trail. So far they've covered 237 miles of the roughly 1000-mile trail. Both are blogging about their journeys as they make their way across North Carolina. You can follow along by clicking here and here. This story is gaining some major national and international recognition. Jordan Romero, a 13-year-old from California, has reached Base Camp on Mt. Everest. If successful this climbing season, he will become the youngest person to ever reach the summit of Mt. Everest. Everest would also be his sixth of the "Seven Summits" - the highest points on each continent. He hopes to become the youngest to reach all "Seven Summits" by tackling Mt. Vinson in the Antarctic later this year. Since his arrival at Base Camp, Jordan has been training and has already made it up to intermediate base camp at 18,700 feet. What percentage of the U.S. surface area is designated as national park? There are 58 U.S. national parks. The largest is the Wrangell-St Elias National Park and Preserve in Alaska, which is two-and-a-half times the size of the country of Wales. You can find a few other interesting factoids by clicking here. Great Smoky Mountains National Park announced details for the reopening of the Cades Cove Loop Road during two celebratory events on Saturday, April 24, and Sunday, April 25. The park has implemented temporary measures and organized personnel to direct traffic and parking to make these events run as smoothly as possible. On Saturday, the Loop Road will reopen only to bicyclists and pedestrians from sunrise (expected at 6:50 a.m.) to noon. Motor vehicles then will be permitted to travel the road starting at noon to sunset. They will not be allowed to arrive any earlier than noon. During the morning hours, Park personnel will be stationed at the Townsend Wye to control traffic to the Cove. They will only allow those who will be recreating in and near the Cove, i.e., walkers, and campers/picnickers, and Great Smoky Mountains Institute at Tremont participants, and will be turning away motorists who plan to tour the Loop Road to help alleviate traffic jams. Motorists will be directed to return at noon. Visitors who plan to explore the Cove in the morning can expect to park in a field as a large number of people is expected. 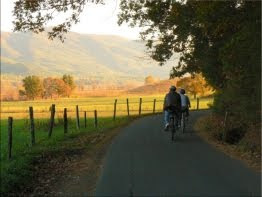 To accommodate visitors who would like to rent bicycles for the day, the Cades Cove Campground Store will open for business at 7 a.m. and will have available for rent multi-speed comfort or mountain bikes, in addition to single speed cruisers. Several safety cautions and regulations should be noted while biking the Cove. Following these standard cautionary practices will make for a pleasant riding experience. Under Tennessee law, helmets are required for persons under 16 years of age, and it is recommended that all other riders wear helmets. Cyclists, particularly those with children, should maintain safe speeds especially on steep grades and around blind curves. Speed is the number one cause of bicycle accidents. Visitors should be aware that there are potentially hazardous situations along what appears to be mostly level land and with the newly paved smooth surface, it will be important to practice safe riding skills, especially if the road surface is wet from rain. Be prepared for changing weather conditions. Park officials also expect traffic to be heavy when the road opens to motorists at 12 p.m. so people should be patient. With the opening of Cades Cove Loop Road, the one way Parson Branch Road will also be open. However, travelers who plan to exit the Cove onto Parson Branch Road must be aware that at its intersection with Route 129 they will only be allowed to travel south into North Carolina because a rockslide on Route 129 prevents travelers from heading north into Tennessee. Signage will be in place at the beginning of Parson Branch Road warning travelers of this change. On Sunday, access to the cove will be restricted and limited to preregistered runners for the special Cades Cove Loop Lope event sponsored by the Friends of the Smokies. The Park expects about 380 runners to participate in this run. Registration for the run is now closed as all available parking has been taken up. Park officials, in partnership with the Friends and the Knoxville Track Club, is organizing this one-time event in recognition of the accomplishment of the long overdue road rehabilitation project. Park personnel will be staged at the Townsend Wye to facilitate traffic flow and allow only those participating in the run, as well as registered campers. Right now, the forecast for Townsend calls for thunderstorms on Saturday, and partly cloudy skies on Sunday. Today is the 40th anniversary of the first Earth Day and the air quality in the United States today is at it's best over that time period. A couple of weeks ago, Dr. Mark J. Perry, a professor of economics and finance at the School of Management at the Flint campus of the University of Michigan, published an article on his Carpe Diem blog about how much the air quality has improved over the last 40 years. 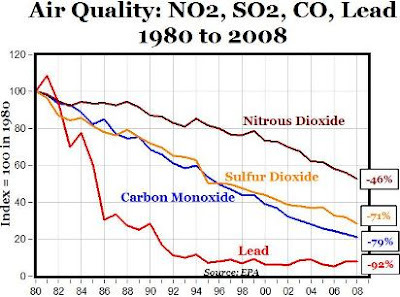 In his posting he mentions that the U.S. population has increased by more than 50%, traffic volume (miles driven) in the U.S. has increased 160%, and real GDP has increased 204%; and yet air quality in the U.S. is better than ever - nitrous dioxide, sulfur dioxide, carbon monoxide and lead have all decreased between 46% and 92% between 1980 and 2008. The Great Smoky Mountain Association has posted the latest wildflower report from Tom Harrington. The report includes a long list of wildflowers Mr. Harrington has seen on the following trails: Turkeypen Ridge, School House Gap, Bote Mountain and the Finley Cane Trail. The Appalachian Trail Conservancy’s specialty license-plate program in North Carolina is distributing $25,000 in 2010 grants to nine organizations for their work on projects to benefit the Appalachian Trail. Projects to enhance the Appalachian Trail (A.T.) experience this year include treadway improvement; maintenance of the popular Overmountain Shelter, commonly called “the big red barn”; and the inventory and control of exotic-invasive plant species along several miles of the footpath. The grants are also supporting newer programs of the Conservancy and its partner organizations for work in Trailside communities and schools. The Nantahala Hiking Club and Franklin Main Street program received support for their involvement related to Franklin’s Appalachian Trail Community designation, the town’s April Fools Hiker Bash, and other A.T.-focused community events. Three grants related to youth and schools were also awarded. The Carolina Mountain Club received assistance for an effort to increase youth engagement in the club. Summit Charter School of Cashiers, N.C., received funds to enhance and interpret a trail on school grounds that serves as an outdoor classroom. Jennifer Pharr Davis’ Blue Ridge Hiking Company will provide assistance to eight schools implementing curricula related to the Conservancy’s Trail to Every Classroom program. That program uses the A.T. as a learning tool for placed-based education and includes a component of service learning for teachers, all intended to increase awareness of the Trail and encourage youth to become stewards of it. Two groups received funding to study birds along the A.T. The Southern Appalachian Raptor Research will initiate a bird education program and monitor the Northern Saw-whet owl population, habitat, and breeding at Big Bald, near Wolf Laurel, N.C. Mountains-to-Sea Ecological will provide a baseline survey of rare and common breeding birds at a number of high-elevation sites along the Trail in the state. Defining bird populations along the Appalachian Trail as part of ATC’s citizen-scientist-based environmental-monitoring program will help determine what species are at risk, the factors that influence bird species' distribution and population numbers, how severely population numbers are changing, and how the birds will fare in the face of climate change or other stressors. With that information, land managers and policymakers will be better able to protect the birds’ habitat to ensure their continued survival. Vehicle owners who support the Conservancy’s work through their Appalachian Trail license-plate purchases make the grant program and associated projects possible. Please click here for more information. A new program, "Reward Yourself - Hike the Smokies Challenge" in 2010, was announced yesterday by the Great Smoky Mountains National Park in order to help visitors reach individual milestones. The park will distribute mileage record books for free on Sunday, April 25, at Sugarlands and Oconaluftee Visitor Centers between 10:00 a.m. and 4:00 p.m. and at the Cades Cove Visitor Center from 1:00 p.m. to 5:00 p.m. After April 25, the pocket-size booklets will be available at the three visitor centers for $1.00. The challenge is to keep track and record the mileage from each trail excursion, even if it is the same trail day after day. As a recreational benefit, when a person has "hiked" 100 miles, 250 miles, and 500 miles, he/she can bring their mileage record to one of the three visitor centers to receive a mileage pin and be recorded in the "Hike the Smokies" 2010 web records. The program was designed to give visitors a little motivation to get out and enjoy the great outdoors. A video podcast, Day Hiking in the Smokies: Expect the Unexpected will also be launched on April 25th. This 3-minute video podcast will help visitors prepare for the weather extremes that can be found in the Smokies during a day hike. Two additional video podcasts are being developed in this series for release this summer and fall that will provide additional tips on hiking safety in the Smokies. "Day hiking in the Smokies is a good way to get exercise while also discovering the beauty of this area," said Park Superintendent Dale Ditmanson. He continued, "With over 800 miles of scenic trails to choose from, the possibilities for day hikes are endless." This project was made possible in part by a grant from the National Park Foundation through the generous support of The Coca-Cola Foundation, a Proud Partner of America’s National Parks, and in cooperation with Great Smoky Mountains Association and Great Smoky Mountains National Park. Traveling in a chosen mode at a pace that allows us to immerse ourselves in the surrounding environment far surpasses what we might experience as a passerby in a speeding car. In addition to the scenery, serenity, stimulation, and the intrinsic rewards that come with walking, hiking, riding, and climbing, the pathway uniquely presents life “lessons.” The trail can be a great teacher if we allow ourselves to reflect on the nature of our experience. In fact, the trail is a perfect metaphor for life itself. That is the opening paragraph from "Twenty life lessons from the trail,” by Dr. Ronald R. Bearwald. This highly philosophical article appears in the Spring 2010 issue of American Trails Magazine. As the title implies, the article offers 20 lessons we as hikers can take from the trail, and apply to our overall lives. "The trail has been, and will continue to be a great teacher." It's a great read - very thought provoking. Please click here to check it out. 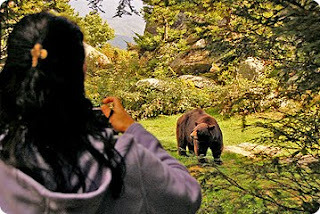 Beginning this Saturday, April 24, the general public will have the opportunity to go behind the scenes of Grandfather Mountain’s Animal Habitats. Two new exciting programs are being offered in the wildlife habitats: "Behind the Scenes" habitat tours and "Keeper for a Day" outings. Behind the Scenes habitat tours give the public an opportunity to see where the animals sleep, learn about what it takes to care for the animals year-round, observe a training session, and learn why the animals call Grandfather Mountain their home. The Mountain’s knowledgeable and experienced keepers will gladly answer any questions as they guide participants on their tour. Each tour takes approximately one hour and 30 minutes. Participants must be able to walk up and down steep terrain, wear closed toe hiking or work boots, dress in layers and be willing to sign a waiver of liability. The cost for the Behind the Scenes habitat tour is $75 per participant ($50 each for annual pass holders). To schedule an available tour date you must book 48 hours in advance and dates can be found under the “Wildlife Habitats” tab on www.grandfather.com. In addition to Behind the Scenes habitat tours, guests may choose to learn what it takes to care for the animals by becoming a “Keeper For a Day.” Keepers for a Day will shadow the habitat staff, interact with the animals, help with the cleaning and feeding, and assist with enrichment activities for the animals. Participants must be 12-years-old or older, capable of walking up and down steep, rough terrain and must be willing to sign a waiver of liability. Lunch with the Habitat staff is included and each participant will be given a work shirt. The “Keeper For a Day” outing must be booked one week in advance by sending an e-mail to habitats@grandfather.com. Please allow 24 hours for a response. The cost is $200 per participant ($150 each for annual pass holders) with park admission and lunch included. This program will be offered April 20 and the second Tuesday of each month May through October. For more information please call the Grandfather Mountain Habitat Office at 828-733-8715. Grandfather Mountain is a 600-acre scenic attraction and nature preserve located near Linville, NC on US Highway 221, one mile from the Blue Ridge Parkway at milepost 305. For more information on these programs, please click here. For information on hiking at Grandfather Mountain State Park, please click here. A first-aid course for wilderness settings will be offered this weekend (April 24 and 25) by the Haywood County, North Carolina chapter of the American Red Cross. The course is designed for anyone who works, lives or participates in activities in remote areas where medical help may be delayed. The 16-hour course covers everything from treating serious injuries in the woods and evacuating hurt patients to outdoor maladies like hypothermia. Call 828-456-8141 or click here for more information. Ranger Confidential: Living, Working, and Dying in the National Parks is a new book written by Andrea Lankford in which she relates the real stories behind the beautiful scenery of our national parks. 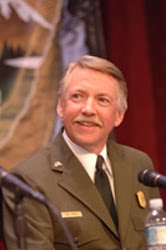 Lankford is a former national park ranger and the author of three other books, and has been published in several national publications such as USA Today, Arizona Highways, and Backpacker Magazine. For twelve years, Andrea lived in the biggest, most impressive national parks in the world, working a job she loved. She chaperoned baby sea turtles on their journey to sea. She pursued bad guys on her galloping patrol horse. She jumped into rescue helicopters bound for the heart of the Grand Canyon and has even won arguments with bears. In this graphic and yet surprisingly funny account of her and others’ extraordinary careers, Lankford unveils a world in which park rangers struggle to maintain their idealism in the face of death, disillusionment, and the loss of a comrade killed while holding that thin green line between protecting the park from the people, the people from the park, and the people from each other. Ranger Confidential is the story behind the scenery of the nation’s crown jewels — Yosemite, the Grand Canyon, Yellowstone, Denali and the Great Smoky Mountains. In these iconic landscapes, where nature and humanity constantly collide, scenery can be as cruel as it is redemptive. Volunteers are needed for extended work trips on the Appalachian Trail in the Great Smoky Mountains National Park this summer. The Appalachian Trail Conservancy, which maintains the 70-mile stretch of the AT through the Smokies, runs volunteer trail crews every year known as “Smokies Wilderness Elite Appalachian Trail Crew,” or S.W.E.A.T. Tools, equipment and food are provided free. All volunteers have to do is show up. The leadership staff teaches trail construction techniques, Leave-no-Trace practices and safe use of trail tools. S.W.E.A.T. crews work six days in the field arriving on the afternoon before their work session for dinner and orientation. A long (as much as 10 miles) and sometimes strenuous backpacking trip, with considerable elevation change will be required to access the work site. Additionally, the crew week may also require long day hikes. Campsites will likely not be optimal; willingness to camp in unlikely and cramped spots is crucial. “If you ever wanted to give back to the A.T. and you don’t mind some hard work while having fun, the S.W.E.A.T. crew is the ticket,” said Andrew Downs, trail resource manager with the ATC in the region. Six-day work trips will run from June 6 to August 17th. The need is particularly great this year due to the harsh winter, which pummeled trails. The Asheville Chapter of FRIENDS of the Blue Ridge Parkway announced this week the publication of a revised, updated edition of its popular brochure, “30 Hikes.” The brochure describes 30 day-hikes along the Mountains-to-Sea Trail in the Asheville vicinity, each with parking and access from the Blue Ridge Parkway. The new edition was funded by a grant from REI Asheville. The brochure rates the difficulty and describes the special features of each hike. The latest edition also includes a map and tips on having a safe and enjoyable hike. The brochure is free and available at the Visitor Center near Parkway Headquarters, the Folk Art Center, and the Craggy Gardens Visitor Center, as well as at REI Asheville in Biltmore Park and Diamond Brand Outdoors in Arden. You can also download an online PDF File copy by clicking here. Late last week, a visitor called 911 and reported a canoe pinned on rocks above Angel Falls Rapid (Class IV) on the Big South Fork of the Cumberland River in the Big South Fork National River and Recreation Area. Two boaters were clinging to the rock at the head of the rapid. Multiple drownings and boating accidents have occurred at this rapid (which has severely undercut rocks) in recent history. Rangers, Scott County Rescue Squad members, and river guides from Sheltowee Trace Outfitters all responded and participated in the rescue. Once safety measures were put into place, a modified Telfer lowering system was employed and a raft with a rescuer was lowered to the victims. After being on the rock for nearly three hours, the two men were able to jump into the raft, which was pulled to safety. Mark Ellison, a doctoral student at North Carolina State University, is studying the restorative benefits of backcountry hiking and the relationship to job satisfaction. “I know from personal experience that hiking in natural environments is restorative, that it provides opportunity for reflection because there are not demands on attention; and that the experience is transforming for people,” Mark said. This research is being conducted for a doctoral dissertation at North Carolina State University. This is the first research on the topic and will provide the foundation for future research on the restorative benefits of backcountry hiking and how it may benefit the workplace. The online survey includes questions related to your experiences while backcountry hiking, and specific questions about your workplace and supervisor. It takes roughly 5 minutes to complete and doesn't ask for any personal information. This is a great opportunity to help a fellow hiker out. Click here to take Mark’s survey. 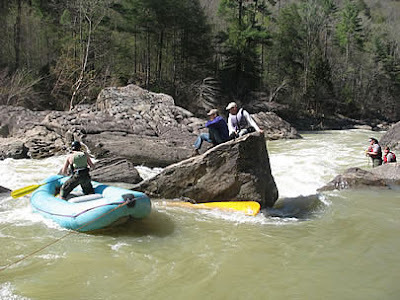 The third annual Nantahala Ooutdoor Center Freestyle Shootout kayak rodeo on the Nantahala River will happen this weekend, April 17 and 18, in which some of the biggest names in paddling will dish up their best stunts and tricks. Similar to skateboarding or snowboarding on a half-pipe, freestyle kayaking involves technical tricks and highly-stylized moves — including spins, turns, cartwheels and flips that often involve the boater going completely airborne. The NOC Shootout is one of only six events in the country where paddlers can score points toward the USA Freestyle Kayaking national championship series. Paddlers are hoping freestyle will be recognized as an official Olympic sport for the 2012 games. The NOC competition begins late Saturday morning and runs throughout the afternoon. The top five paddlers in each class advance to the finals on Sunday. The awards ceremony is Sunday evening with $10,000 in cash and prizes on the line. Throughout both days, visitors can enjoy a festival-like atmosphere that includes live music. Open surf will be offered on the wave feature from 8–10 p.m. tonight. Afterwards, there will be a freestyle kayaking presentation by Eric Jackson, founder of Jackson Kayak. He will talk about the rules, moves and scoring of freestyle kayaking at The Pourover. Last week park managers at Great Smoky Mountains National Park announced plans to conduct a series of controlled burns in the Cataloochee Valley area near Maggie Valley. The first burn is scheduled to begin today. As a result, the Little Cataloochee Trail may be closed today and tomorrow. Weather conditions will determine if the fire can be conducted. If you plan to hike in this area, you should plan an alternative hike in the event that the trail is closed when you arrive. If wishing to hike in that area of the park today or tomorrow, check with the park website for the latest information. About a year and a half ago I posted an article about a then 12-year-old who was on his way to conquer Mt. Vinson, the highest point in the Antarctica. Although that expedition was abandoned, Jordan Romero now has his sights squarely on Mt. Everest, the second last hurdle for him in becoming the youngest person to reach the highest point on all seven continents. The record is currently held by Johnny Collinson who reached the top of Mt. Vinson earlier this year, thus completing all Seven Summits at the age of 17. As of right now Jordan is on his way to Base Camp at the foot of Mt. Everest in the Himalayas. 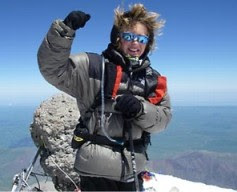 If successful, he'll become the youngest person to conquer the world's highest mountain. The current record for the youngest climber of Everest is held by Nepali Temba Tsheri, who was 16 when he reached the peak in 2001. If Jordan succeeds in the Himalayas this spring, he will then attempt the Vinson Massif later this winter, at which point he would smash Collinson's record by three years. When I first came across Romero's story I was truly impressed and thought it was amazing that someone of his age could be so focussed on such a feat. However, I don't have any children. A friend of mine brought Romero's quest up in a recent blog posting that provides the perspective from a father. As Dana more or less points out: Where or how did Jordan come up with such an idea at the age of nine? Is he being pushed into a dangerous situation by his dad, perhaps for his own ambitions? Dana compares Jordan exploits to his own on a bike ride up Trail Ridge Road in Rocky Mountain National Park as a young teenager. You can read the article by clicking here. In addition to offering a different perspective on this story, Dana provides an entertaining tale of his cycling exploits on the highest road in the United States. So, what do you think? Is Jordan's goal and aspirations admirable and exciting, or is he being pushed by an irresponsible parent? Pregnant mountaineer Kate Suleman is preparing to climb Mt. Everest, which at 29,035 feet in height, is the tallest mountain on the planet. If she is successful, her unborn fetus will set a new record for the youngest person to ever reach the summit of the mountain. Click here to read the full report. A Duke University study that reconstructs thousands of years of fire history in the southern Appalachians supports the use of prescribed fire, or controlled burns, as a tool to reduce the risk of wildfires, restore and maintain forest health and protect rare ecological communities in the region's forests. Professor Norman Christensen Jr. and his team said their study, the first of its kind, involved radiocarbon analysis of 82 soil charcoal samples dating from 1977 to more than 4,000 years ago. The samples were used to reconstruct the fire history of a 25-acre site in western North Carolina's Nantahala National Forest. "These are the first hard data showing that fires have occurred relatively frequently over much of the last 4,000 years and have played an important role in the health, composition and structure of southern Appalachian forest ecosystems," Christensen said. Analysis of the charcoal samples demonstrated fires became more frequent about 1,000 years ago. That coincides with the appearance of Mississippian Tradition Indians, who used fire to clear underbrush and improve habitat for hunting, Christensen said. Fires became less frequent at the site about 250 years ago with the arrival of European settlers, whose preferred tools for clearing land were the axe and saw, rather than the use of fire. The relative absence of fire over the past 250 years has altered forest composition and structure significantly, Christensen said. Aside from historic and scientific interest, knowing more about presettlement fire regimes may help forest managers understand the likely responses of species to the increased use of prescribed fire for understory fuel management, Christensen said. You can read the full story by clicking here. The complete study appears in the journal Ecology. And if you can make it, and need some suggestions on the best trails to see wildflowers, please click here. Hundreds of volunteers are expected to turn out for the 26th annual spring cleanup of the Tuckasegee River around Cullowhee, NC this Saturday (April 17). The event has become the largest single-day river cleanup in the nation. Volunteers get a life jacket, paddle and trash bags then climb aboard rafts to troll the river and fish out trash. No rafting experience is necessary. A free cookout with live entertainment is held after the cleanup, including door prizes donated by local businesses. Register on the A.K. Hinds University Center lawn between 11 a.m. and 1 p.m. the day of the event. The first 600 volunteers receive a free T-shirt. Wear old clothes and bring gloves. Call 828-227-3625 or click here. A couple of weeks ago my wife brought home a flyer that was left on her car entitled "Drum Hike". Beginning at 9am on April 17th at the Louisville Slugger Museum in Louisville, KY, Iraq War Veteran Troy Yocum will begin a 7,000-mile hike across America - while banging a drum. With Emmie the SuperDog by his side, Yocum will beat his drum to sound the call in order to raise $5 million to help military families in need. He believes it will take him 16 months to complete his quest. Specialist Troy Yocum was born and raised in Louisville, Kentucky. He joined the Army National Guard on August 21st, 2001 just days before 9/11 and spent the next 3 years at duty in various capacities. In 2007 his battallion was called up for a 13-month deployment in Iraq and Kuwait. In addition to a military career, Yocum is an accomplished drummer, having played with several up and coming artists spanning many different genres. While in Kuwait, he made an attempt at the Guinness World Record for the longest drumming time, but had to end his attempt after temperatures reached over 100 degrees which forced him to cramp up on the second day. Yocum's journey, beginning this Saturday, will take roughly 16 months to complete. He'll pass through 30 states and 38 large cities. He plans to average over 20 miles a day, and will be taking an estimated 50 million steps across America. Yocum will make appearances at 20 baseball parks. 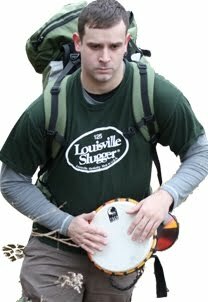 During his journey, Troy will be carrying a custom Louisville Slugger bat for mayors and governors to sign along the way. Troy will then present this bat to the White House on May 11th. If you would like to help Military families in need of financial assistance, please consider making a donation or make a pledge based on each mile Troy walks. 100% of all donations will be distributed to needy Military families through the Soldiers' Angels' financial assistance program. In honor of National Park Week and the 40th anniversary of Earth Day this month, Shenandoah National Park's Skyland Resort is offering a special promotion where guests can book one night and receive the second night free. The offer is valid April 18-29, 2010. ARAMARK Parks and Destinations, an authorized concessioner of the National Park Service, recently announced several deals on lodging, tours and retail items in conjunction with the National Park Service's Fee-Free promotion and the 40th anniversary of Earth Day. In addition to receiving free entrance to the national parks April 17-25, visitors can take advantage of buy-one-get-one free offers on lodging and tours at select destinations managed by ARAMARK. Guests can also receive 40 percent off select 100 percent recycled tees at retail shops during the week of April 17-25 to celebrate the 40th Anniversary of Earth Day. Guests of Shenandoah National Park in Virginia can book one night at Skyland Resort, priced at $125, and receive the second consecutive night FREE. This offer is valid April 18-29, 2010. Please click here for more information. ARAMARK is offering similar deals at other parks as well, including Mesa Verde National Park, Olympic National Park, Glen Canyon National Recreation Area, as well as the Togwotee Mountain Lodge near Yellowstone National Park. Please click here for more information. > If you're planning on doing some hiking at Shenandoah, please click here for a list of trails and some recommended hikes. Blue Ridge Outdoors Magazine published an article on their website earlier this week that offers suggestions for tackling the best of what the Appalachian Trail has to offer. BRO Magazine took an interesting take on this subject. While trying to include some of the best sections of the Appalachian Trail, they broke down their recommendations based on 2, 3, 4 and 5-day hiking options. They offered two "weekend" or two-day hikes that include the 13-mile McAfee Knob / Tinker Cliffs hike near Roanoke, and the 14-mile A.T./Mau-Har Trail Loop near Waynesboro, VA. For experienced hikers that are in great shape, either of those hikes could be tackled in one long day. They also offered two three-day hikes: The 26-mile section of the Mount Rogers High Country in southwestern Virginia, as well as the 29-mile Nantahala Gorge Ridgetop hike near Franklin, North Carolina. Their recommendation for a four-day hike is the classic A.T. trek through the Great Smoky Mountains. Their five-day backpack trip takes hikers 48 miles and includes the Nolichucky River, Roan Mountain, Grassy Ridge Bald and Overmountain near Johnson City, TN. Each hike listed in the article includes key points of interest, mileage and camping information. To read the full article, please click here. > For more detailed information on hiking the A.T. through the Smokies, please click here. > For more information on the hike to the Summit of Mt. Rogers, please click here. > For more information on Roan Mountain and the hike to Grassy Ridge Bald, please click here. Great Smoky Mountains National Park will host author Hattie Caldwell Davis on Saturday, April 17, from 10:30 a.m. – 2 p.m. at the Oconaluftee Visitor Center. Ms. Davis was born in Cataloochee Valley and attended the Beech Grove School. She has written four books about life in Cataloochee: Reflections of Cataloochee Valley and its Vanished People in the Great Smoky Mountains; Step Back in Time to See Historic Cataloochee Valley of the Elk; Historic Cataloochee Tour Guide; and Civil War Letters and Memories from the Great Smoky Mountains. She will be available to sign books, which can be purchased at the center’s bookstore, and talk with visitors about her life in Cataloochee and the history of the people in the valley. Ms. Davis’ written works detail life in Cataloochee Valley from 1834-1934. She tells family stories of how her ancestors settled in the valley, how they lived, and of the heartbreak of having to leave Cataloochee for the establishment of the park. She also describes the scenery when Cataloochee was a farming settlement, the virgin forests and the animals that once roamed the area, but later vanished, such as the panther and wolf. Her books include a number of historic photographs that help tell the stories of the people of Cataloochee Valley. Contact the Oconaluftee Visitor Center at 828-497-1904 for additional information. Last year over 50 Citizen Scientist volunteers helped researchers collect scientific data on ash trees by mapping the locations of hundreds of these trees in Great Smoky Mountains National Park. The mapping project, which will take several years to complete, will be used to monitor future threats from a nonnative insect. People are again being invited to join park biologists and educators during a field day on Saturday, April 17, from 9 a.m. to 1 p.m. in the Greenbrier area of the park. Volunteers will learn how to identify ash and other common trees found in the Smoky Mountains, read a topographic map, and use a GPS (Global Positioning System) unit. The ash trees are at risk from the invasive, non-native Emerald Ash Borer (EAB), a beetle that can travel undetected in firewood and nursery stock from quarantined areas of the country into new locations in the Park. In 2009 the park installed EAB traps near campgrounds and picnic areas as part of a detection plan. So far no EABs have been found. This is the first of seven ash tree mapping days through the summer and fall that will be held in the Tennessee and North Carolina sides of the park. Other dates planned are June 9, July 31, August 28, September 11 and 25, and October 2. These are listed in the Events Calendar on the park’s website: www.nps.gov/grsm. Volunteers should be prepared to hike up to 5 miles on park trails and in rough terrain off the main paths. It is recommended that participants wear long pants and comfortable closed-toe shoes or boots for hiking and bring snacks, water, sunscreen, and rain gear. Reservations are necessary and participation is limited to 16 people (children 12 and under must bring an adult). Contact Ranger Susan Simpson at 865-436-1200, ext. 762, to RSVP and for meeting location. As part of the A.T. Museum’s dedication, a hike-in will be offered beginning from the Buck Ridge trailhead (1,200 feet elevation) at the Kings Gap Environmental Education Center on South Mountain. The six-mile route to Pine Grove Furnace State Park tops off at 1,525 feet at the 1.75 mile mark before descending to reach the gentle, rolling terrain of the three-mile homestretch. The hike will occur on Saturday, June 5, 2010 and there will be a staggered start from 7:45 a.m. to 8:30 a.m. There is a limit of 150 hikers. Registration will close once this limit is reached, or on May 28, 2010, whichever occurs first. There is a registration fee of $25 (by May 15) or $35 (by May 28) which includes light, cold breakfast treats and drinks at the check-in, preferred seating for the A.T. Museum’s dedication ceremony, and a special edition A.T. Museum commemorative patch. Proceeds will benefit the Appalachian Trail Museum. 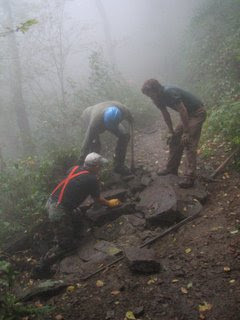 Trail work trips are also scheduled for the day after the museum opening, Sunday, June 6, 2010. The Cumberland Valley Appalachian Trail Club (CVATC) and the Mountain Club of Maryland have scheduled a work trip on the Trail in the vicinity of South Mountain and the Alex Kennedy shelter on Sunday, June 6. Meet at Pine Grove Furnace State Park (home of the A.T. Museum) at 8:30 a.m., then carpool to South Mountain. Plan to work until around 3 p.m. and be back at the park around 4. Lunch and tools will be provided. Wear work clothes and boots. For more information, visit CVATC's website or e-mail cvatclub@gmail.com. Also on Sunday, June 6, the York Hiking Club is planning a brush-clearing and trail clean-up trip on the A.T. on Peters Mountain. Meet at 8:30 a.m. in York at the York Hiking Club north meeting place or contact Jim Hooper (717-252-3784 or j.e.hooper@ieee.org) to arrange to meet at Peters Mountain. Sign up now for one of the coveted spots on a rare guided hike in the Waynesville watershed to be held Saturday, April 24. The 8,600-acre preserve is off limits to public recreation except for twice a year when the North Carolina town sponsors hikes. The three-to five-mile hike will be led by Dr. Peter Bates, who will discuss the development of the Waynesville watershed management plan as well as current conditions within the watershed, and by Naturalist Don Hendershot, who will discuss the wildlife and wildflowers found along the way. Eric Romaniszyn, director of Haywood Waterways Association, will also attend to discuss water quality throughout the county. Spots go quickly. Click www.townofwaynesville.org or call 828.452.2491. Backpacker Magazine is again seeking readers who would be interested in becoming a gear tester for the publication in 2010. The magazine is seeking six passionate, frequent hikers who understand equipment and aren't afraid to tell it like it is. If you match this profile, you'll need to enter the online contest. If you happen to be one of the lucky winners, you’ll be given regular testing assignments between May 1 and October 1, 2010. Selected applicants must spend at least 25 nights camping and hike a minimum of 250 miles during that same time period. Winners will be given regular testing assignments and their names (and photos) will appear in the magazine. To register for the contest you'll need to send a short (150 word) sample gear review of your favorite piece of gear to Backpacker. Also, the magazine is requiring that you produce and post a YouTube video in order to introduce yourself and show why you would make the perfect Backpacker Magazine Gear Tester. Backpacker editors will choose six finalists. Deadline for submission is April 19, 2010. For more information, please click here. The latest Wildflower Report from the Great Smoky Mountains Association was posted by Steve Kemp yesterday. Mr. Kemp reports that wildflowers at lower elevations in the Great Smoky Mountains are at peak bloom right now. Wildflowers are abundant along the Little River and Cucumber Gap trails in the Elkmont area right now. Trout-lily, hepatica, spring-beauty, and anemone are all blooming. We should have a good peak of bloom between now and April 20 at the lower elevations. To read this and past reports, please click here. To see a list of some of the best wildflower hikes in the Smokies, please click here. 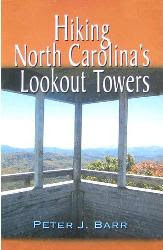 Peter Barr, Chair of the Carolina Mountain Club Challenge Committee, and author of Hiking North Carolina’s Lookout Towers, is hiking the Appalachian Trail to raise money for the restoration of the Shuckstack fire tower in the Great Smoky Mountains National Park. On March 22, Peter started his hike from Springer Mountain in Georgia. His goal is to raise a dollar for every mile that he hikes on the Appalachian Trail for the restoration of the Shuckstack Lookout Tower in the southern Smokies. For those interested, you can follow Peter's journey by clicking here. To find out more about his campaign and help the Shuckstack Fire Tower, please click here. For more information on hiking to the Shuckstack Fire Tower, please click here. On Sunday, April 25 from 10 am to 5 pm, Great Smoky Mountains National Park will celebrate National Park Week with a community service project that will involve performing trail improvements to the Elkmont Nature Trail located at the Elkmont Campground near Gatlinburg, Tenn. Thanks to the Coca-Cola Foundation and the National Park Foundation, this community service project will provide families and individuals an opportunity to do hands-on trail work and become involved in creating a better environment. The Elkmont Nature Trail is an easy ¾ mile self-guided loop. The project will include tasks for both youth and adults, from cutting back vegetation to using hand tools to repair sections of trail tread and create water bars (a support structure that diverts water away from a trail). Great Smoky Mountains National Park will provide all the necessary equipment needed, including work gloves, for the project. Volunteers should come prepared to work for a day in the woods. It is suggested that participants dress in good sturdy foot wear and long pants. Since volunteers will be working a full day, it will be necessary to pack a lunch and plenty of water. Youth volunteers must be accompanied by an adult and are required to be at least 10 years of age. To attend this event, interested persons need to RSVP by April 19 to the Trails & Facilities Volunteer Coordinator, Christine Hoyer, at 828-497-1949. This service project is being made possible in part by the Active Trails! grant from the National Park Foundation through the generous support of the Coca-Cola Foundation, a Proud Partner of America’s National Parks. The Active Trails! grant was designed to enhance your National Parks’ trail resources and promote healthy lifestyles. Administration officials announced last week that they will host a White House Conference on America’s Great Outdoors on Friday, April 16th. Nancy Sutley, Chair of the White House Council on Environmental Quality, Ken Salazar, Secretary of the Interior, and Tom Vilsack, Secretary of Agriculture, are leading the conference, which will address the challenges, opportunities and innovations surrounding modern-day land conservation and the importance of reconnecting Americans and American families to the outdoors. This conference will bring together leaders from communities across the country that are working to protect their outdoor spaces. Participants will include working ranchers and farmers, sportsmen and women, State and local government leaders, Tribal leaders, public lands experts, conservationists, youth leaders, business representatives and others who view the outdoors as integral to their communities. The discussion will center on the conservation opportunities in communities, the challenges facing them, and the innovative solutions they are crafting from the bottom up. The conference will offer an opportunity for participants to engage with each other, learn from past and ongoing efforts, communicate how the Federal Government can support these efforts, and identify new opportunities to work together to modernize our approach to conservation, and reinvigorate the national conversation about our outdoors. There's no word on how uninvited citizens can participate or provide input on any of these issues. The second annual Horace Kephart Weekend in Bryson City, North Carolina will be held on April 30 - May 2, this year. This special event celebrates the life and works of author and national park advocate Horace Kephart. It's sponsored by the Swain County Chamber of Commerce, the Horace Kephart Foundation, the Great Smoky Mountains Association, and Great Smoky Mountains National Park. All events are free and open to the public. 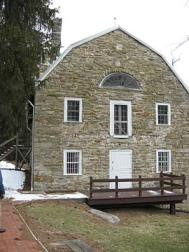 Friday, April 30: Park rangers or volunteers will lead two guided hikes in the Deep Creek area. The long hike will be to Bryson Place (12 miles roundtrip) and the short hike will be under 5 miles roundtrip. At 7:00 p.m. at the Arts Center in Bryson City there will be a special illustrated program on Horace Kephart and George Masa and a major announcement relating to their works. Saturday, May 1: There will be a Ceremony at the Cemetery at 10 am. Then starting at 12 noon at the Train Depot there will be music with Daniel Gore and friends, a camping reenactment, music with Lee Knight, and a Kephart Family Book Signing with GSMA Book and photo sales. Sunday, May 2: At the Historic Calhoun House there will be Cherokee Storytelling and music by Lee Knight. For more information go to www.horacekephart.com. According to a new assessment released earlier in the week by the National Parks Conservation Association (NPCA) and the Appalachian Trail Conservancy (ATC), the Appalachian National Scenic Trail faces many challenges that put the experience of visitors and trail resources at risk. Adjacent land development on privately owned land, sources of air pollution, and funding shortfalls impacts the ability of trail managers to protect historic structures and preserve trail resources. “The Appalachian Trail attracts millions of hikers each year, and we must ensure its unique American experience is protected for future generations to enjoy,” said Ron Tipton, NPCA’s senior vice president of policy. According to the new assessment, approximately 10 miles of the immediate Trail corridor are not publicly owned, and only about 150 properties remain to be acquired to protect trail resources. Many of these areas remain vulnerable to incompatible development or land use, including proposed pipelines, powerlines, residences, energy-producing wind turbines, and motorized off-road vehicle and mountain bike use. A primary way that trail managers can protect additional lands is through support from the Land and Water Conservation Fund, a federal program that provides funds for land acquisition. While Congress has funded AT land acquisitions consistently over the past 30 years, additional public/private funding is critical for resource protection. The National Park Service and the ATC have a unique management partnership, in which these organizations share resources, but are forced to make difficult decisions on how limited funding is spent. For example, staffing and funding is needed to interpret historic sites and expand community-outreach programs. Report findings indicate the trail could benefit from National Register of Historic Places designation, which could make the trail eligible for additional funding. Another challenge facing the trail in some locations is poor air quality, which has a profound effect on hiker health and enjoyment of the trail. The NPCA and the ATC are advocating for stronger regulations on nearby coal-fired power plants and other sources of pollution to improve air quality and protect the health of hikers, wildlife, and trail resources. To view a copy of the Appalachian National Scenic Trail: A Special Report, and take action to help protect the park, please click here.